The link below is to an article on book collecting. The link below is to an article that looks at how one person gets around being a life-long book collector. The link below is to an article that looks at book collecting. What books do you collect? Let us know in the comments. The link below is to an historical piece on book collecting for soldiers overseas during World War I. 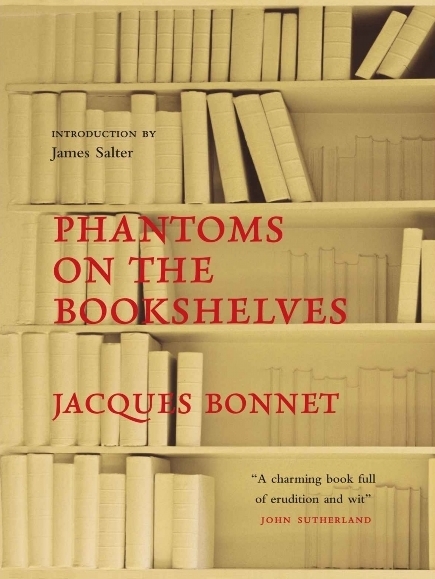 ‘Phantoms on the Bookshelves,’ by Jacques Bonnet was translated from the French original by Sian Reynolds and has an introduction by James Salter. The copy I have is a Kindle edition. It was first published in Great Britain in 2010 by MacLehose Press. It is a relatively short book at 123 pages in length, so it won’t take too much to get through it. The introduction to the book by James Salter is a good, brief read concerning the author of the book and his book collecting ways. It could easily describe me, though I have nowhere near as many books as Bonnet, even though I have thousands myself in traditional form and/or digital format. I see similarities between the description given of Bonnet by Salter and myself, with my far fewer volumes. I too struggle now to find room for them all, with my virtual bookshelves requiring expansion in the near future to accomodate my book collecting ways into the current century and digital age. Traditional books have long run out of room in this house, as I suspect they have in Bonnet’s apartment. Bonnet is a man who loves books and his thoughts on what is normal in a home, the presence of many books, is something I can relate to. I also find myself in wonder when I see homes with no books, particularly in some of the circles in which I move or have moved. How can they get by without books? Mind you it is probably not as easy a situation to read (no pun intended – truly not) these days, with books now being able to be stored by the thousands on a home computer and/or on an external hard drive or two. Still, I have wondered this for many years and I think Bonnet would probably agree with me. Relating to others is made easier when discussing books for Bonnet and I find this an agreeable thing also. It is the way of Bibliophiles, whether we use that term or not (perhaps for some Bibliomaniac is a better term). I did not find Bonnet’s chapter on cataloguing and organisation helpful at all, though I expect it would help some. This is probably because I have developed my own system which closely resembles that of the Dewey to almost certainly be called a Dewey system. The Bonnet decsription horrified me and I thought it would become far too confusing and disorienting for me. He is certainly right about the Internet making a major impact on libraries and the need to have as many books as he has in his collection. It is not only the storing of works on the World Wide Web, in the cloud and on other digital storage systems like computers, external drives, etc, where libraries are changing and/or have changed, but also in the cataloguing and organisation of books. I have a large number of books stored on digital devices and by digital means, but I also have access to far more over the Internet from vast libraries that I can access online. But I also have both offline and online digital methods for assisting me in cataloguing and organising my books, which I use as best I can and with great relief for being able to do so. Yet it boils down to individual choice and comfortableness, being able to manage these resources in a way that allows the individual to harness them to the greatest effect, which is indeed something of an indiviual matter and process. The Bonnet method of reading will not be everyones cup of tea, but that’s OK too, because that is also a very individualistic thing. Bonnet likes lying down to read, I prefer sitting at a desk. Bonnet likes to underline and write in his books as he reads, I prefer to highlight and collate quotes via other media. There is no one rule for all, but many different rules for many different people. The thing is to retain what one reads in some way, that I think is the key to reading. It is certainly not a requirement to read each and every book from cover to cover, but to take a dip in each one to some extent and to achieve some purpose when doing so is required if you wish to say that you read your books and they aren’t just display items. The manner in which Bonnet has collected his books is almost baffling to someone who has not done so in the same manner. He seems almost obsessed with completing lists and collections of books, of following every author/book line that comes up in what he reads or experiences. It seems any book mentioned must be obtained for his library. This is the way of a Bibliomaniac, that is for sure. His obsession with collecting ‘picture’ books is another seemingly crazed hobby which almost seems to be a driving force for him. I too collect books, but this insight into how another book lover and lover of reading goes about collecting his books is one that is beyond my experience. It is a fascinating world of book hunting and gathering if ever there was one. Something about one book leads to another which leads to another, or some conversation leads to a book which leads to another, etc. Bonnet’s reflections upon his books shows someone who truly absorbs what he reads and imbibes the being of those written about. He seems to feel them, to know them, far better than any creator of them. Authors of books, whether fictional pieces or biographical/autobiographical works fade with the passing of time, if indeed a true reflection of them is left in the pages of the books they write or in the annals of history. However, those created and placed within the realms of literature remain the same and can be known almost completely. There are places to visit, whether real or ethereal, people to meet and to greet. Books bring a whole world to one’s home and experience, and even beyond that one travels into the realm of fictional lands and peoples. A plethora of experience that is only exaggerated when the library is swollen by multimedia resources. What an amazing world the library can become – is.